It’s another bag of yummy colorful bowties that are ready to be served with your favorite sauce. 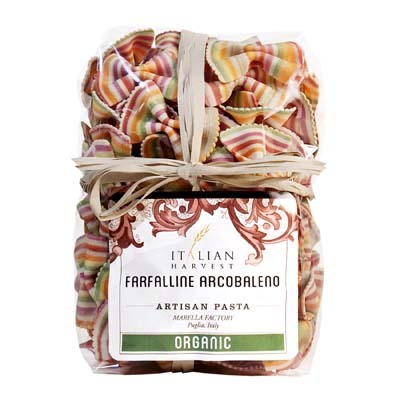 These are Farfalline Arcobaleno or Little Rainbow Bowties. A delightful creation of Marella pasta in the Puglia region, this dry pasta dough maintains its pretty colors, even when you cook them. Best with pesto, light cream sauces, or simply toss with some butter and Parmesan cheese. This way the sauces don’t cover up the pasta’s bright pretty colors. Another brilliant pasta creation from award-winning Marella pasta, don’t wait for it to go out of stock. Get one for your pantry today!